To start off, I am going to be doing my reviews a little differently. I am going to try, key word here is try, not to basically type up the whole book. Yeah. 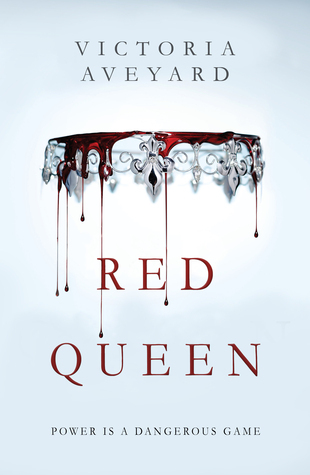 Red queen is like X-Men with the powers, but they are hereditary. Or so you think. Silvers have the powers. Reds do not. A little bit of The Selection in that the crown prince has to choose a queen from everyone presented to him. The Hunger Games from the revolution that is happening underneath everything. And of course. Bits and pieces of the author’s own creation. The main character, Mare Barrow, is a Red. She is called to work at the palace after a run in with some guy at a bar one night. Her first day she finds out that she too has powers like the Silvers. No one knows why. So the queen merges her into the royal court by saying she is the long lost daughter of a general that died many years ago. Well 17 years ago. She is to be married to the younger son, Maven. But really, she totally has a thing for Cal. Who just happened to be the person she ran into at the bar that one fateful night. While all of this stuff is going on, there is an uprising amongst the Reds. They are “destroying” things and really just being the start of a revolution. As the book goes on Mare and Maven join. As well as Mare’s best friend from home. So they all devise a plan to attack the Summer Palace the royal family is staying at currently on the farewell ball. It doesn’t really go over as planned. People get captured. Mare sets them free with the help of one of her tutors. Mare gets stabbed by a guard and bleeds all over the floor. This is important. After the ball, and after the prisoners are let out, the royal family leaves to go to the regular palace. As they are going up the river Mare sees how the country really is. And hates it. Her and Maven, and the revolution, decide to plan another attack. This one went even worse. Almost everyone in the revolution died. Maven was really with his mother planning every little thing. The queen made Cal kill his father. Mare and Cal get away and find the rest of the revolution. Mare’s brother. Who is supposed to be dead. And he has powers too. They then set off to find others like them. This entry was posted in Uncategorized and tagged author, book, book review, book reviewer, books, red queen, review, reviewer, the hunger games, the selection, victoria aveyard, x men. Bookmark the permalink.